The air classes are admittedly a little questionable, since there’s comparatively little airbending done in the show (for reasons made obvious by the show’s title), but I think it could work. You could also come up with a few other classes like lava bending and combustion bending (does that have an official name?) if you wanted to. Maybe even some non-bending, martial arts only classes as well. Sadly, given the quality of, I don’t know, every TV-to-game adaptation ever, I imagine it wouldn’t be as awesome in practice as it is my head. I guess I’ll just have to stick to my Guild Wars 2 Elementalist for my Avatar MMO fix. 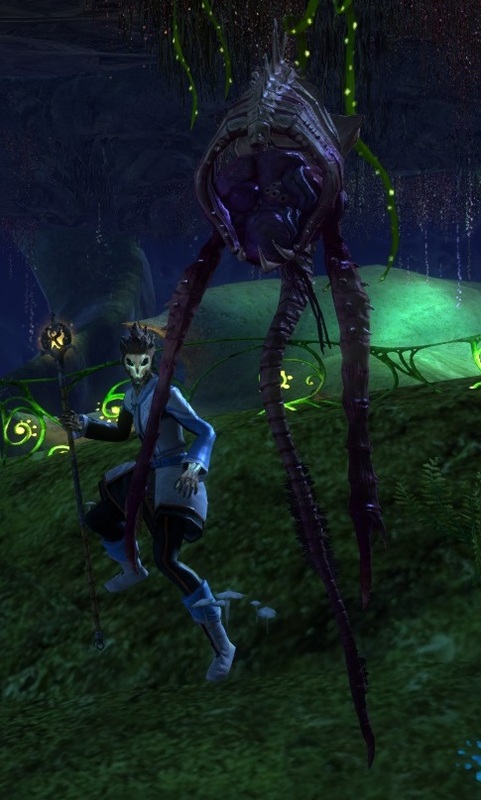 Seriously, some of the ele’s attacks are so similar to ones used in the show, I find it hard to imagine that the creators of Avatar never played Guild Wars, and/or vice versa. I know, I know, people have been asking for this one since about 2005. I’m going to talk about it again, because it’s my blog, dangit. For better or for worse, World of Warcraft was and continues to be an unparalleled, industry-dominating, runaway success. And yet, with the Blizz turning their vaporware MMO Titan into the class-based shooter Overwatch (which, admittedly, as a person who generally hates shooters, actually looks strangely appealing… not as appealing as if it were an MMO, but appealing nonetheless), it seems they’ve lost faith in the MMO industry. This is especially sad since I think StarCraft would have made the MMO transition as well as or better than Warcraft. Anyone want to try a three faction MMO? If anyone could pull that off, it would be Blizzard, but more likely the factions would either follow the recent single faction trend or have Protoss and Terrans be playable fighting Zerg. I’d love to wander around the various planets of the Koprulu Sector as a Dark Templar stealth DPS or a Terran Marine tank, running dungeons centered around taking out Cerebrates and Zerg-infested Terran colonies. I’ve always thought sci-fi was a much better setting for an MMO than fantasy anyways; it’s easy to explain varied environments as different planets, it’s more difficult to make them all seem like they exist on one continuous plane, especially when it comes to adding new zones. There exists a very impressive mod of StarCraft II that basically turns it into an MMO (maybe I should move this to the “deserves better” section below). To be honest, I’ve never played it (it’s been on my todo list forever), but, regardless of how good it is, it’s a free, fan-made mod; it’s never going to be as good as a full-blown MMO developed by the monolithic Blizzard Entertainment. It’s no secret that Nintendo hasn’t made it in the black for the last couple of years. Hopefully that’s changing (now that there are finally some actually good titles available and in the works for the Wii U), but if they really want to move software and its associated hardware, look no further than a Pokemon MMO. Who wouldn’t want to run around in a Pokemon world populated, not with NPC trainers, but real people? Trades and battles would be only a click away. X/Y’s Internet connectivity was ok, but it doesn’t beat actually seeing other players and talking to them while you trudge around in the tall grass for wild Pokemon. There have been a couple of fan projects to do something like this, either from scratch or by hacking multiplayer into the originals, but, to my knowledge, none of them have made it far enough to be viable, and generally get sued before they make it very far. I’d settle for a shameless ripoff of the Pokemon formula if someone would just do it well. This is a franchise that I’ve only recently delved into. I picked up the excellent Shadowrun Returns on sale recently. It’s a reimagining of a popular tabletop RPG as a tactical strategy RPG. I love tactical RPGs, and the high-quality, hand-painted graphics, and tabletop-style descriptive narrative really immerses you in the cyberpunk sci-fantasy world. Naturally, I started poking around to learn more about the series, and came across Shadowrun Online. Granted, I haven’t played it, but from what I’ve read in various reviews, it’s basically a lackluster cash-in on Shadowrun Returns’s success, with minimal multiplayer elements. While the game is still in early access, the reviews on Steam are almost universally negative, the positive ones being more along the lines of “well, it’s getting better” than actual praise. Combine that with the fact that the game costs as much as Shadowrun Returns and its expansion, Dragonfall, combined and I think I’ll be giving this one a miss. Still, as I play through Shadowrun Returns, I can’t help but feel that this would make a great traditional MMO. It has a loyal following and a ton of lore built up, and I think it would lend itself to shooter-style action combat perfectly. The classes and spells are already spelled out for you, all you have to do is make those work in an MMO and you’re golden. Besides, the world needs more sci-fi MMOs. Seriously, how has Lego not made their own version of Minecraft yet? How cool would it be to walk around in a world made of Lego bricks that you could pick up and move around at will? It wouldn’t have to be an MMO, but games like Landmark and Trove are proving that there’s a market for Massively Multiplayer voxel builders and the formula does work. It would be easy to incorporate elements from the pantheon of Lego franchises as NPCs and mobs. There’s a free-to-play Lego MMO out there called Lego Minifigures Online, but it’s basically a Diablo clone for kids. And when I say for kids, I don’t mean in the way that the Traveler’s Tales games (Lego Star Wars, Batman, Marvel, etc.) are, that is, simplistic, charming, and more fun than you thought possible. I mean it’s really watered down and downright boring. It’s basically a plot to sell physical minifigures with a code so you can use them as characters in the game, a la Skylanders. I suppose I would have had fun with it when I was under ten (it’s like that’s their target audience or something), but isn’t Lego all about being fun for people of all ages? Minecraft-like games fit that bill exactly. I’m sure I could go on with many more franchises that would be the perfect fit for an MMO. Sadly, licensed MMOs are a risky venture, and, while titles like Lord of the Rings Online and Marvel Heroes prove it’s possible, I don’t really expect to see any of these things any time soon. Anyone else have any theoretical franchise MMOs they’d like to see? This is a part of my MMO Tourism series. For more information on the series, click here. I thought it would be apropos for my first blog post under its new name, Occasional Hero, to be a superhero MMO. DC Universe Online is a game that somehow never caught my interest. I’m certainly not opposed to superheroes or anything–I have seen and enjoyed most of the perennial Marvel and DC movies and such–but the idea of a superhero MMO doesn’t excite me in and of itself. DCUO went F2P while my college career was ramping up, so I didn’t have much time to sample new free-to-plays, and also had the unfortunate timing of being right before the launch of Star Wars: The Old Republic, for which I was very excited. That said, as I mentioned last time, I’m really sick of fantasy, so any other setting would be preferable at this point. And there are a lot of things I like about comic books, like the way they throw together a bunch of characters that don’t really make sense together and make it work. In a world without comic books, who would believe that a movie about a Norse god, an arrogant millionaire in a Chozo powersuit, a scientist who gets really strong when he’s angry, and a guy who’s really good at shooting arrows would be one of the most successful and hyped movies of all time, raking in over 1.5 billion dollars and shattering a bunch of box office records in the process? 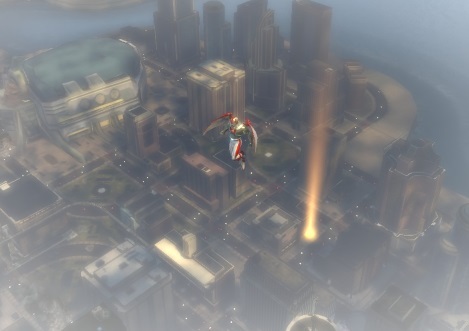 I’ve played a few other superhero MMOs, and none of them were that great. Champions Online had a cool character creator, but sadly that was the most I had in that game. Marvel Heroes was entertaining for a while, and I still pop in and play every so often, but it lacks substance. Hopefully DC has a better showing. Sadly, I missed out on City of Heroes/Villains. The way everyone talked about it when the plug was pulled made me wish I had, but of course at that point it was too late. The character creator has a lot of nice variety to it. I can think of no other MMO that lets me choose between playing as a humanoid fox, wolf, zombie, cyborg, or crystal. I find it interesting that you choose your super powers and weapons before customizing your character’s appearance. I’m not sure if they’re trying to be different, if they think this shows an emphasis on combat versus looks, or if I’m reading too much in to it and they just did it that way because it was convenient for them. Weapons seem more important than super powers, but lack description. Are some more tanking focused? Damage focused? Do some synergize better with certain powers? I just had to guess, but I like the idea of a highly customizable character. The character customization interface is somewhat clunky and unintuitive. There are a lot of menus to drill down through, and it’s easy to get lost in them. For instance, when you click Customize, you can choose Skin, Gear, and Colors. When you click Gear at this stage, you can customize the looks of your various pieces of gear. But if you choose colors, there’s another Gear button. On more than one occasion I tried to back out of the Colors menu to change some of my gear and ended up going to the gear color changing menu. I don’t understand why I couldn’t just choose the colors on the same menu where I choose the gear. Perhaps worse is trying to choose a men’s hairstyle. Rather than having hair and facial hair be separate options, you have to scroll through every possible permutation of hair/mustache/beard possible. My guess is that the reason for the poor interface is that it was designed with the console port in mind. It’s a minor annoyance, but an annoyance nonetheless. Speaking of minor annoyances, I’m also a little annoyed that i can’t customize my character’s face. I’m guessing that the developers thought it wouldn’t be important since most of the head gear consists of masks that cover the face. Super heroes are supposed to be anonymous anyway, right? I ended up with flight (which was a great choice), nature power (a healing role), and the staff weapon. As previously mentioned, I have no idea if these work together. I chose them solely on the basis of the fact that they looked cool. Here’s Biomimetic Lifeform. Yes, I know, I’ve been watching too much Star Trek lately (if that’s even possible). The opening cutscene is nothing short of epic. It makes you wonder the whole time why every hero in the Justice League is getting their you-know-what handed to them. Then, just as Luthor has finished off every DC superhero you’ve ever heard of, he realizes there’s a bigger threat. Then you’re introduced to the wibbly-wobbly timey-wimey stuff; the game takes place in an alternate universe where Luthor has traveled back in time and used Braniac technology to infuse a bunch of random normal people with super powers. It’s an ingenious explanation of why there are suddenly thousands of supers you’ve never heard of (i.e. players) running around. I really enjoy the animated comic book-style cutscenes. “These humans resist my assimilation.” Humans seem to be pretty good at that in just about any universe. I guess I’m not the only one who’s been watching a lot of Star Trek. Speaking of Star Trek, is Brianiac… voiced by… William… Shatner? Thus far the voice acting has been pretty unimpressive. Hopefully it’ll get better, but I’ve played games with mediocre voice acting before (I’m looking at you, Guild Wars 2) and it hasn’t bothered me too much, so I think I’ll survive. The tutorial itself is pretty standard; attack some trash mobs that are no threat to you whatsoever, level up once or twice and learn how to slot skills, equip gear, etc. You’re dropped into a Braniac ship and guided by Oracle (Oracle is a superhero? More like supervillain… I knew from the moment they bought Sun Microsystems that… wait, sorry, different Oracle) to the mandatory incredibly-easy-to-destroy weak spot of the ship. Seriously, haven’t you seen Star Wars? Finally, Superman appears and there’s a kind of bonus round where you fight alongside him to defeat all of the evil (and extremely weak) robots. I’m pretty sure I could just stand in a corner and let him beat down all of the bad guys, but who hasn’t dreamed of being Superman’s temporary sidekick? When I first stepped into DCUO and started messing around with the combat, I groaned. It’s basically the same as The Elder Scrolls Online’s combat; aim with the mouse, click to attack, blow a few cooldowns now and then. They also both have console versions, which also makes me nervous. How dumbed down will it be so it can be played with a controller? I was pleasantly surprised to find my fears unjustified, however. 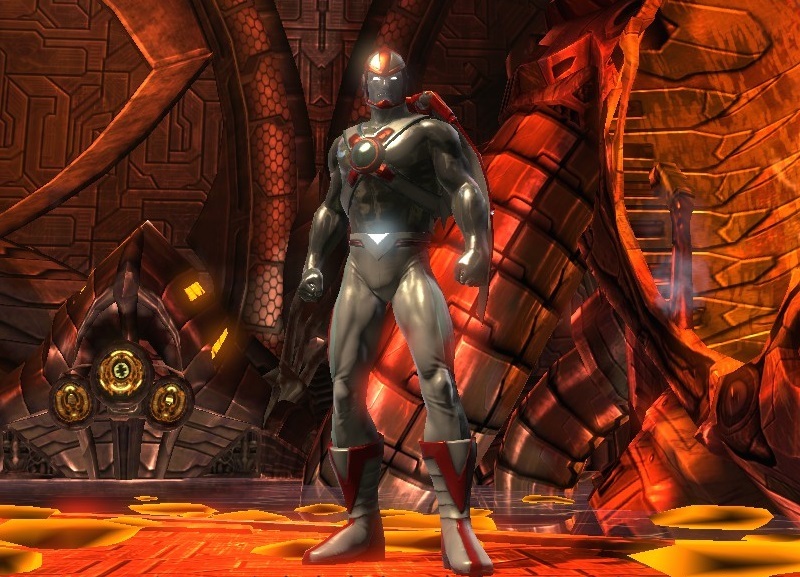 DCUO isn’t just “click to attack, hold to attack harder” like The Elder Scrolls Online. First of all, the left button is always melee and the right button is always ranged, regardless of weapon. Holding the mouse button activates, not just a stronger attack, but a different attack. For instance, with the staff weapon, holding the left button makes your character jump to his target and attack, and holding the right button shoots a projectile related to your superpower (in my case a ball of thorny plant mass), which is a nice touch. What makes DCUO’s combat even better than TESO’s is the combo system. As you level you can put points into your weapon skills, adding passive bonuses to existing attacks, or creating new combos you can do by executing a series of left or right clicks and hold clicks. Moving around in DCU is a pleasure, especially when you choose the flight power. I especially like that my “Tech Wings” actually flap when I fly. The first thing I did when I exited the tutorial? Flew straight up until I hit the top of the game. The second thing? Turned off my flight power and dropped like a rock. Fortunately for our hero, there is no fall damage in DCUO. Seriously, though, why would you choose any other power? If you do, acrobatics and super speed allow you to run up walls (and some ceilings) and jump really far, so it’s not like there’s a lot you can’t access. Also, is it just me or does “Acrobatics” turn you in to Spider-Man? Whoops, wrong universe. I also like how your movement power gives you combat abilities later on. I’m guessing that flight’s powers are super nerfed, because otherwise I feel like everyone would choose it. Maybe that’s just me. What was unique about this game? I think the most unique thing about this game is its console version. It’s the only major MMO (other than the ill-fated Final Fantasy XIV) that I know of that launched both on the PC and on 7th-gen consoles (feel free to correct me if I’m forgetting something). I took it for a spin on my PS3, and it actually plays remarkably well. The only problem is that I feel like the hotkey skills would get frustrating, but I guess it could also be seen as an element of strategic planning ahead. Perhaps this calls for more investigation. Also unique is the combat. This is the farthest thing from a WoW-like MMORPG that I’ve ever seen that I think still belongs in the same category. I don’t think every MMO should try to emulate it, but if you’re an action game fan, this is the MMO for you. 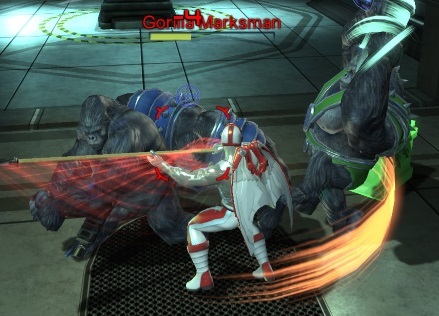 DC Universe’s F2P is pretty much the same story as most MMOs these days. They started out subscription-only, and, after about a year, they added a free-to-play option. Like many games, free accounts get access to pretty much what the game launched with, with “DLC” (which we used to call expansions back in my day) unlocking new areas, story content, and classes. I had a hard time finding a features matrix, which made me a little nervous, but the only big downsides I can see for F2P players is limitations on classes and zones (unlocked with DLC) and a currency cap. I can’t really offer an opinion as to whether or not either is ridiculous, as I’m not very far in the game. Surprisingly, yes… but probably not on a regular basis. Going in, I didn’t think I would like this one. I played the Elder Scrolls Online beta and hated its take on “action combat,” so I figured this would be similar. But I found myself really enjoying beating things up in DCUO. Maybe it’s the pace, or maybe it’s the addition of combos and more slot skills. Or maybe it’s just because it’s not set in yet another generic fantasy world. Either way, I think I’ll be visiting Metropolis again in the future. First of all, let’s open with some comments on the state of the MMO space to date. Like it or not, World of Warcraft is king. It has the most players, has been around longer than anything still running with the exception of EverQuest and perhaps a few more obscure titles, and is without a doubt the most recognizable MMO title. MMORPGs now fall into two categories: WoW clones, and not-quite-WoW-clones. There have been many games that have tried to take them on, but no one has really succeeded. Some have even directly attacked the MMO giant (and, debatably, failed spectacularly). But I’m going to go on record here and say that if any game to date can take on WoW, it’s Wildstar. This game takes all of the ideas that I like from Guild Wars 2 and all of the ideas I like from WoW-like games and mashes them together. Also, I know I’m starting this project off on the wrong foot by playing a subscription-based game, but it was in free open beta last week, so I figured it technically counts. Anyways, let’s make a character, shall we? So I’ve had a bit of a lull in the various games I play lately, so I thought I’d try something I’ve been meaning to try for a long time now. I’ve seen various bloggers call it various things, but I’m calling it MMO Tourism. Basically, I’m going to give a variety of free-to-play MMOs I’ve never played before (or only played briefly) a try. I’ll create a character and do at least the tutorial and the first zone or two. Then I’ll write a shortish travelog about my experience. Bio Break did this about a year ago, and while I was compiling my list of games to try, I noticed Why I Game started a “game hopping vacation” as well. (I know I’ve seen this a few other places, but those were the only ones I could dig up) I’ve enjoyed reading other peoples’ exploration of strange new MMOs, I hope someone else does too. Commentary on character customization, races, classes, etc. Would I play again, and why? I plan on trying for one a week. Any other suggestions on free MMOs to try out? Check the MMO Tourism tag for updates! I finally made it: my engineer, Isoni, finally hit 80, rather unceremoniously in the middle of a heated underwater battle (I hate underwater combat… there’s a reason why GW2 is the first game I’ve seen in years actually implement it, and I hope it’s a good many years before I see it again). It’s been some time since I actually got a character to the endgame in an MMO (I think Star Wars: The Old Republic was the last, and that was nearly three years ago), and I guess it’s kind of refreshing to actually finish a character for once. Not as refreshing as you might imagine, though; I’m one of those strange people who seeks the journey rather than the destination. It’s probably why I’m such an altaholic… but that’s a subject for another post. 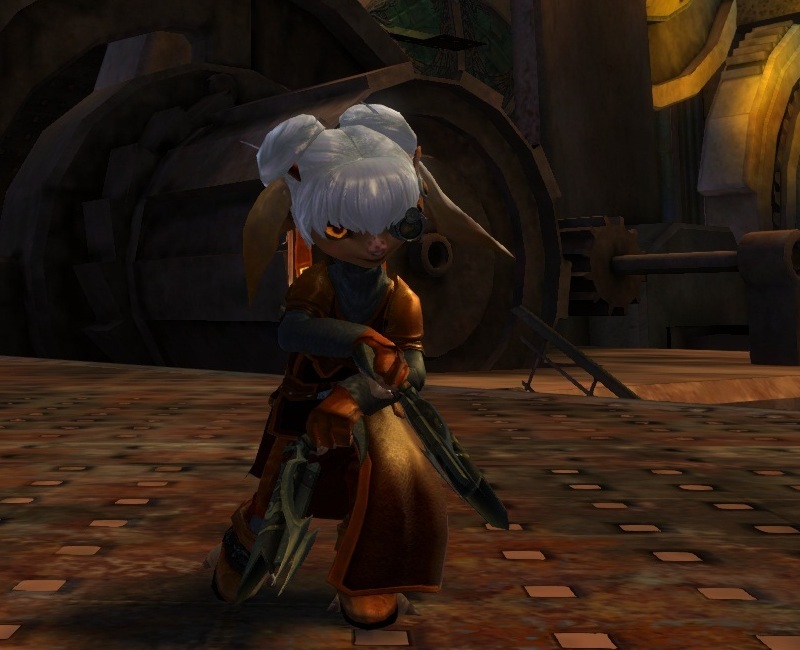 This post is about my thoughts on getting a character to 80 in Guild Wars 2.